University News coverage of RIT’s Frozen Four odyssey earned “Best in Show” honors at the PRSA Rochester 2011 PRism Awards. 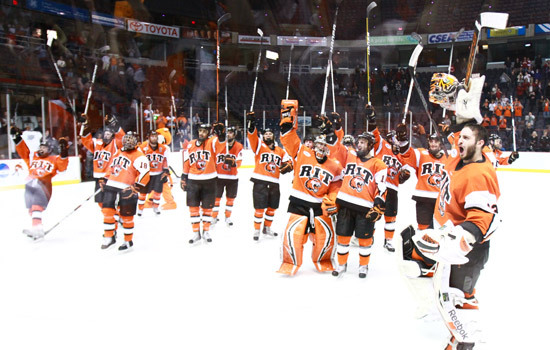 Basking in the afterglow of last year’s NCAA Frozen Four appearance by the Rochester Institute of Technology men’s hockey team, RIT University News has “lit the lamp” with its comprehensive coverage of this unforgettable milestone. RIT University News claimed Best in Show honors for its entry “RIT: NCAA Frozen Four Appearance” during the PRSA Rochester 2011 PRism Awards ceremony held June 9 at Artisan Works. The entry, recognized as a PRism Award winner for excellence in the category of Crisis or Issues Management Communication, was singled out among all other winning entries submitted from the not-for-profit sector. RIT’s entry highlighted the comprehensive nature of the communication program employed to exploit a national spotlight that accompanied the Tigers’ sudden emergence among college hockey’s elite programs. A berth in the NCAA’s prestigious Frozen Four tournament proved remarkable—and highly unexpected—for a program with only five years of Division I experience and offering no athletic scholarships. University News tapped its long-standing ties with the Rochester-area media to maximize local coverage while building new relationships with media from across the country, many curious to ask, “Who is RIT?” Finally, the department ramped up its presence on Facebook, YouTube and Twitter to build an online community devoted to Tigers hockey that exploded in size during the weeks surrounding tournament action. This is the second time University News has earned Best in Show honors at the annual PRism Awards. It follows a winning entry in 2005 that was also submitted in the Crisis or Issues Management Communication category. The Rochester chapter of the Public Relations Society of America sponsors the annual awards program, which recognizes creative impact in both the corporate and not-for-profit sectors. Members of the Maryland PRSA chapter were charged with judging this year’s PRism Award entries. Overall, there were about 110 entries submitted by various Rochester-area organizations.